Sometime ago, I had a request to create a painting of a Steller's Sea Eagle, and I finally completed it. The banner has the person's name on it, but I photoshopped that out for privacy reasons. I was excited to have an opportunity to paint one of these magnificent birds of prey. This is one of the largest eagles in the world, rivaled only by Harpy Eagle and Philippine Eagle. Wing spans range from an incredible 7 to 8 feet, and females (larger of the 2 sexes) can weight between 15 and 20 pounds. They feed mainly on fish, such as salmon, but will prey on other water dwelling birds, and mammals as well. They live in the eastern parts of Russia, and winter a bit south of there in Japan. 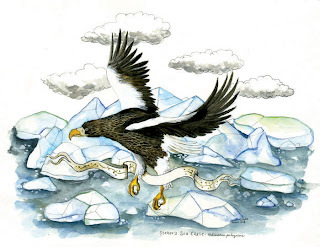 In order to create the painting, I had to rely on various random photographs, as the collections at the Field Museum do not have any specimens of Steller's Sea Eagles. A few weeks ago while in for my regular volunteer shift, I asked Dr. Willard if I could look at one, and I got a flummoxed look. He ran off to check the records, and sure enough, it was one of the few things that the collections lack. He wryly commented that the next time he finds himself on the Kamchatka peninsula, he would pick one up for me. I decided not to wait. Ooo I love this! I saw sea eagles (Steller's i think) in the Lofoten Islands in Norway in 2005. There were so many of them on Vaeroy island they filled the sky. I think we saw 12 at one time. It was an incredibly moving experience. I take that back, based on distributions shown on Wikipedia (which may very well be suspect) the one I saw has to be the White-tailed Eagle (Haliaeetus albicilla). Still spectacular.